Each year Japan receives many visitors from overseas. During peak seasons, the number of tourists as well as the variety of languages increases. Panasonic is responding to the rising demand for "omotenashi" or hospitality at tourist destinations, in the cities, hotels, etc. with its multilingual solutions. Automatic audio translation devices: "Megahonyaku (Mega Translation)," "Stationary, Pendant-type automatic audio translation device"
Panasonic currently offers 3 types of automatic audio translation devices that can be used to provide assistance to tourists. When users speak, the device automatically translates into the desired language and also reads it aloud. For example, users can use the Megahonyaku (Mega Translation) as they would a traditional megaphone. All they have to do is speak into the microphone in Japanese, and after it recognizes their voice and analyzes the sentence, the device automatically translates the sentence into 3 other languages. And when users push the button, it will read out the sentence in the original Japanese as well as the other languages. This device is optimal for providing information to inbound tourists in crowded public areas such as train stations and airports. The "stationary automatic audio translation device" on the other hand is handy for one-on-one communication in hotel lobbies, tourist information centers, etc. Users can use a large touch screen to display maps and photographs to help provide assistance to visitors more efficiently. They can also program names of local areas and persons into the translation engine to customize it for specific regions and facilities. 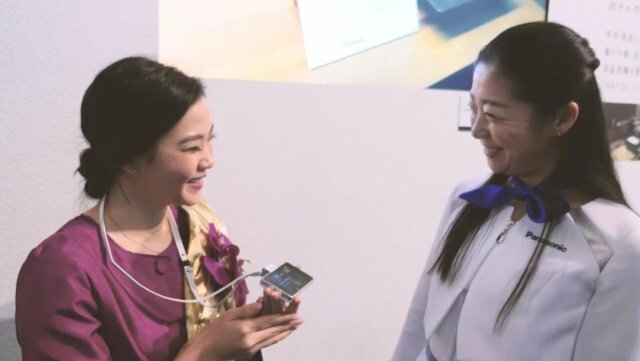 Panasonic also provides a more portable solution, the wearable, "pendant-type automatic translation device." Users can wear this device around their neck to communicate with people in Japan while on the move. Tomokazu Ishikawa, a staff engineer at Panasonic Corporation, AVC Networks Company commented, "The translation engine used in all of these devices supports 4 languages, English, Chinese, Korean, and Thai, but we will continue to add more languages in time for 2020. We are also currently developing a 'corpus extension engine' that can search for sentence samples available on the Internet to enhance its accuracy, and we hope to provide authentic translation that also incorporates a wide range of colloquial and up-to-date expressions." Read signs and menus in the desired language with: "TranslLet's!" The demand for multilingual solutions that can display signs and menus in different languages is also rising. Panasonic has developed a technology that can provide essential information for tourists to their smartphones in various languages. Fujita Takeshi, a supervisor at Western Japan Business Development Department, Panasonic Solution Technologies Co., Ltd. said, "'TranslLet's! ', which uses a new 2D code to provide information to customers' smartphones, has alleviated the constraints associated with traditional 2D codes. Rather than using barcodes with complicated shapes that could only be read from close by, color barcodes are made up of 3 colors - yellow, cyan, and magenta - so when shown on print materials, signage, and displays, they can be scanned from a distance by multiple users simultaneously. Moreover, the 'TranslLet's!' app and servers work together to gather user attribute data, so train stations and shops that use 'TranslLet's!' can access information about popular products, menus, and events, and use that information for future campaigns." Send a wide range of information to users' smartphones in their preferred language with: "Light ID Technology"
"Light ID" is also drawing attention as a means of scanning ID. Light ID delivers information to people's smartphones by embedding ID information into light. This may be applied to signage using LED lighting or digital signage, or lighting for shop windows. It would be impossible to provide information in various languages on signage and in shop windows due to the lack of physical space. However, because the display information is automatically switched to match the smartphone language setting, Light ID can help avoid clutter and provide multiple layers of information while maintaining a clean, attractive display and surrounding space. Offering multilingual services is not only important for creating a town ideal for Tokyo 2020, but also for various commercial facilities and public transportation. Panasonic will provide a wide range of multilingual solutions that are optimal for different scenes and objectives to help provide high quality "omotenashi" to travelers from overseas.